Inspired by the lucrative practice by local, state and federal agencies of shaking down the traveling public at suspicionless checkpoints around the country, armed and dangerous individuals unaffiliated with said government gangs are starting to break in on the action as well. Case in point, on April 22, 2010 while traveling along a lightly traveled road late at night in Harris County, Texas, two women were assaulted by highwaymen at a fake (non-government sponsored) roadblock (see article below). After coming to a stop in front of traffic cones setup in the lane of traffic, armed men rushed out from the woods, surrounded the vehicle and demanded that the women get out. Instead of complying, the driver had the good sense to slam her car into reverse and flee the roadblock but not before several bullets were fired into her car. Luckily, neither woman was physically injured during the encounter. As the traveling public continues to be conditioned to accept arbitrary interference in their daily lives at suspicionless roadblocks setup by government agents more interested in dominating and controlling than serving and protecting, we can expect to hear more such incidents. It should be noted that government enforcers routinely setup their own 'fake' roadblocks designed to fool the traveling public. Here in Pima County, Arizona, the sheriff's department has been known to use phantom checkpoints as part of it's suspicionless checkpoint regime. These are operations where sheriff deputies waste their time and ours trying to create the illusion that a checkpoint is either in the process of being setup or taken down. This is a practice recommended by the National Highway Traffic Safety Administration which bank rolls most checkpoints conducted by local jurisdictions around the country. Similarly, police departments in other parts of the country have been setting up fake drug checkpoints for years. 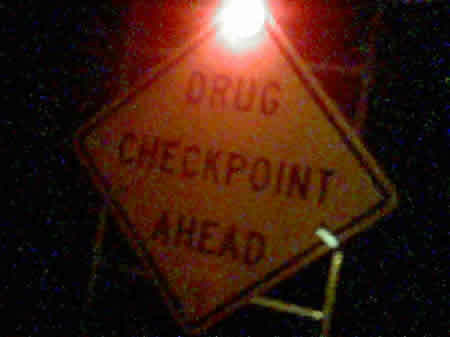 Signs are erected along major highways by police officers indicating a drug checkpoint lies ahead. Usually these signs are placed just before a highway off-ramp or official Rest Area where police officers and K-9 units lay in wait for vehicles choosing to avail themselves of the opportunity to exit the highway. Police then swarm exiting vehicles claiming reasonable suspicion exists to initiate a traffic stop. Drug sniffing dogs are brought out to sniff around vehicles while cops demand ID, check documents and look for any excuse they can find to justify their existence. My thanks go out to Roadblock Revelations readers for bringing the article appearing below to my attention. HOUSTON (KTRK) -- There's a warning about a trick a group of men is using to lure women and rob them. They set up a fake road block on Woodson Park near Lake Houston Parkway in northeast Harris County and attacked a woman who was driving by. What happened to this woman and her daughter was so frightening she says they relive it every day. Woodson Park Drive near Humble is very familiar to a woman ABC13 isn't identifying. She lives nearby. But on the night of April 22, something wasn't right. "It was late at night; it was dark," she said. "Cones were all the way across, all the way across," she said. It was a precursor to something violent. "I thought they were going to kill us," she said. She and her teenage daughter were on their way home that night when they came upon cones blocking the entire street. "So that meant I couldn't even go in that lane," she said. Within seconds, three to four men ran out from the trees and surrounded the car. One had a pistol, another was trying to open the door, and the one on her side had a shotgun and was yelling. "Get out of the car, get out the MF car," she recalled him saying. Both women were screaming, she started honking the horn, threw the car in reverse and was able to get away -- but not before the attackers broke both the front windows and even fired a shot. "At this point, I heard a loud pow," she said. Now the mother of three who is telling anyone who will listen what happened. "I want to warn anybody and everybody," she said. She's learned a valuable lesson about crime. "People need to understand it is not about circumstance," she said, "It's completely and utterly about opportunities." The attackers created an opportunity by setting up a fake roadblock. They got away with nothing, but left a lasting impression. "It's haunting. It's haunting, but I'm even more haunted by what could have happened," she said. In telling her story, the woman says she came across a man who drove by that area just before she did. He wasn't attacked, which leads her to believe they were waiting for women. The two men the victims saw both had masks on. Anyone with any information is urged to call Crime Stoppers 713-222-8477. This is exactly why anyone stopped at a traffic stop where the officers are not following the constitution or the most recent court guidlines citizens should be allowed to avoid the stop by any available methods.